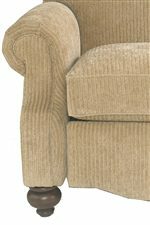 Like the furniture in a pedigreed country club, this recliner cradles you in the luxury of a sectioned tight back, boxed seat cushions, shaped arms and reclining mechanism. Find the perfect spot in your living room, bedroom, den or office for this reclining chair. Available in fabric, leather and leather/fabric combination. The Club Room Recliner with Exposed Wood Feet by Bassett at AHFA in the area. Product availability may vary. Contact us for the most current availability on this product. Modeled to resemble the high quality furnishings of a pedigreed country club, pieces offered in the Club Room collection will be a great addition to your living room. Each piece cradles you in the luxury of a sectioned tight back, boxed seat cushion, shaped arms and nailhead trim around the arms and base. Sofa also available as a queen-sized sleeper sofa. Pieces in the Club Room collection are available in leather, fabric and leather/fabric combination upholstery options. The Club Room collection is a great option if you are looking for Traditional furniture in the area. Browse other items in the Club Room collection from AHFA in the area.